The Trapp Family (German: Die Trapp-Familie) is a 1956 West German comedy drama film directed by Wolfgang Liebeneiner and starring Ruth Leuwerik, Hans Holt, and Maria Holst. Based on Maria von Trapp's memoir, The Story of the Trapp Family Singers, the film is about a novice nun sent to care for the unruly children of a wealthy baron, who falls in love with and marries the young woman. Through her caring influence, the family becomes a famous singing group. When the baron is pressured to join Hitler's army, the family escapes to the United States where they establish themselves as singers. The Trapp Family became one of the most successful German films of the 1950s, and was the inspiration for the even more fictionalized Broadway musical The Sound of Music and its highly successful 1965 film version. The film had one sequel, The Trapp Family in America. At a convent in Austria in the 1930s, a spirited novice named Maria (Ruth Leuwerik) is sent by her mother superior to the estate of a widowed naval hero, Baron von Trapp (Hans Holt), to look after his seven unruly children. The baron is a stern disciplinarian and runs his household like a ship. When Maria arrives, she encourages the children to play games like other youngsters, and teaches them how to sing. When the baron discovers how Maria is ignoring his orders, he sends her back to the convent. Later, when he hears his children singing songs they've learned from Maria, his feelings for her change. Gradually, the baron falls in love with the young woman and proposes marriage. After obtaining permission to marry from the mother superior back at the convent, Maria becomes the Baroness von Trapp. The family's priest, Dr. Wasner (Josef Meinrad), encourages Maria and the children to sing for charity, and soon they develop a large following. After the Nazis annex Austria, the baron loses his fortune and is summoned to serve in the German military. Unwilling to live under the Nazi regime, the von Trapp family emigrate to the United States, where they perform their music in the new world. But their troubles are far from over when a naive Maria tells the immigration inspector they want to stay forever, when he asks how long they will be visiting the United States. The film is based on Maria von Trapp's memoir, The Story of the Trapp Family Singers, written in 1948 to help promote her family's singing group following the death of her husband, Captain von Trapp, in 1947. Hollywood producers expressed immediate interest in purchasing the title only, but Maria refused, wanting her entire story to be told. In 1956, German producer Wolfgang Liebeneiner offered her $10,000 (equal to $92,154 today) for the complete rights to her story. Following her lawyer's advice, she asked for a share of the film profits, but was told that German law prohibited a German film company from paying royalties to non-German citizens—Maria was an American citizen by then. She signed away the rights to her story without confirming that such a law existed (it did not). The same agent that misled her offered her a single cash payment if she would accept $9,000, which she did. Liebeneiner brought in George Hurdalek and Herbert Reinecker to write the screenplay, and Franz Grothe to supervise the soundtrack, which included traditional Austrian folk songs. The movie was filmed on location in Salzburg, Austria, and Murnau am Staffelsee in Bavaria, West Germany. The Trapp Family was released in West Germany on October 9, 1956 by Gloria and became a major success. Two years later, Liebeneiner directed a sequel, The Trapp Family in America, and the two films soon became the most successful films in West Germany during the post-war years. Their success extended throughout Europe and South America. As happens nightly on Broadway, the music really carries the film. Instead of Rodgers and Hammerstein, we now hear genuine folk tunes, light European favorites and the classics. The flavor of these genuinely sweet young voices (dubbed, we assume) is as distinct and clear as an Alpine bell. Thompson concludes, "The children will love it. Nobody, certainly, will resent such a happy family, content to love one another and, thank heaven, to sing." In 1956, Paramount Pictures purchased the United States film rights, intending to produce an English-language version with Audrey Hepburn as Maria. The studio eventually dropped its option, but one of its directors, Vincent Donehue, proposed the story as a stage musical for Mary Martin. Producers Richard Halliday and Leland Heyward secured the rights and hired playwrights Howard Lindsay and Russel Crouse, who had won a Pulitzer Prize for State of the Union. They approached Richard Rodgers and Oscar Hammerstein to compose one song for the musical, but the composers felt the two styles—traditional Austrian folk songs and their composition—would not work, and offered to write a new score for the entire production. The Sound of Music opened on November 16, 1959, at the Lunt-Fontanne Theatre in New York City and ran on Broadway for 1,443 performances, winning six Tony Awards, including Best Musical. In June 1960, 20th Century Fox purchased the film rights to the Broadway musical for $1.25 million (equal to $10,586,333 today) against 10% of the gross, and at that time, also purchased the rights to the two German films for distribution in the United States. 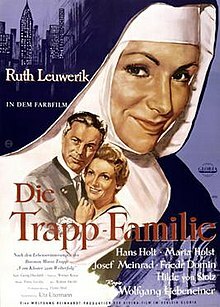 20th Century Fox combined the two German films, Die Trapp-Familie and Die Trapp-Familie in Amerika, hired Lee Kresel to dub the films in English, and released them as a single 106-minute film titled The Trapp Family on April 19, 1961. ^ a b c d Thompson, Howard (August 31, 1961). "The Trapp Family". The New York Times. Retrieved January 8, 2015. ^ a b c d e f g h i Hirsch 1993, p. 4. ^ a b c Hirsch 1993, p. 6. ^ Hirsch 1993, pp. 7–8. ^ Hirsch 1993, p. 8. ^ "The Trapp Family: Notes". Turner Classic Movies. Retrieved January 9, 2015. Hirsch, Julia Antopol (1993). The Sound of Music: The Making of America's Favorite Movie. Chicago: Contemporary Books. ISBN 978-0-809-23837-8. This page was last edited on 17 January 2019, at 17:07 (UTC).